iaedp Recognizes Clinical Excellence in Treatment of Eating Disorders Through our Certification Process. As the rate of individuals affected by eating disorders continues to grow, a greater need for qualified treatment providers in the field exists. iaedp has recognized that need by offering an advanced Certification Program, established in 2002 and continually strengthened and updated to maintain its strong reputation in the mental health field. It is iaedp’s mission to promote excellence in competency assessment for professionals in the eating disorders field through offering a rigorous set of criteria for the evaluation of education, training, knowledge and experience. iaedp’s goal is to provide professional certification that is obtainable and affordable without compromising the high level of standards necessary. Are you interested in obtaining iaedp certification? Click below to learn more about our certification process and how it can benefit your treatment practice. 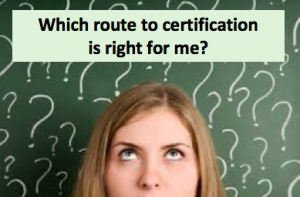 certification (traditional or equivalency) you should use.